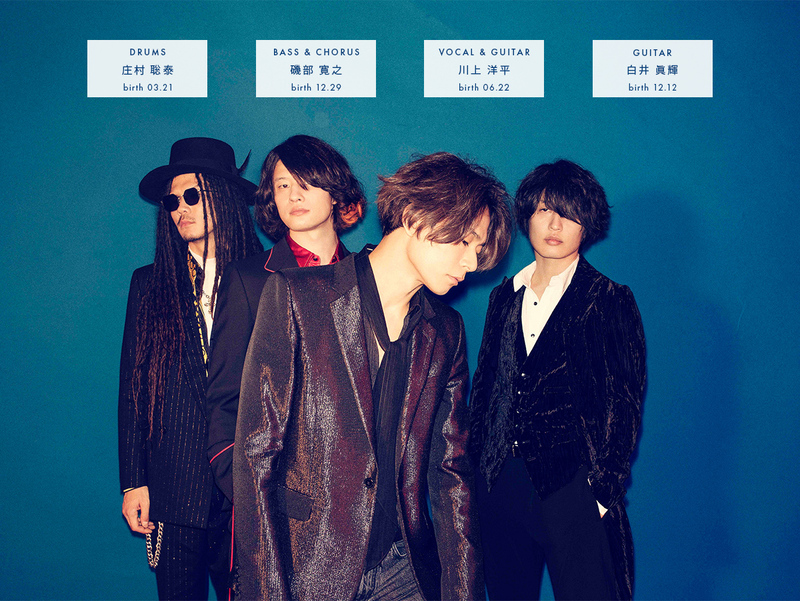 In 2001 [Alexandros] (previously known as [Champagne]) was initially formed by vocalist Yoohei Kawakami and bassist Hiroyuki Isobe. Being brought up in Syria, Yoohei speaks fluent English with unique Middle Eastern accent. He sings both in English and Japanese, not only aggressive rock numbers but sweet and mellow tunes he create. Hiroyuki, spending most of his childhood in the US contributes to the band‘s sound that stands out from the other Japanese local bands. These two young talents got together to form what is to become one of the most original bands to emerge from the land of the rising sun. Guitarist Masaki Shirai joined the group in 2007. In January of 2010, picked up by RX-RECORDS just couple of years after, the band released their first-ever recording and a near-perfect debut album “Where's My Potato?". Regardless of the album coming from a yet-anonymous rookie band, this one gem of a record received great reviews and spread all over the country through word of mouth. The word was out. This is where it all began. In March that same year, the band contributed a Mary Poppins cover track for a Walt Disney compilation "DISNEY ROCKS!!" distributed exclusively via Village Vanguard, a subculture merchandise/book store chain. This helped the band gain great recognition. A month later, Satoyasu Shomura who had occasionally supported the band became the official drummer. This led to the now four band members to move to Tokyo, sharing one house together to focus on their musical career. The band released a couple of EP's during the rest of the year including "city" on July 7th, which was chosen as heavy rotation on a music channel Space Shower TV for July, and “You're So Sweet & I Love You" on Nov. 24th. The band concluded 2010 with their performance at famous Countdown Japan event. The band released their sophomore album "I Wanna Go To Hawaii." on Feb. 9, 2011. Just like 1st album, new album got rave reviews from the press that triggered even more buzz to spread across the country and the album debuted at No. 14 on Oricon Weekly Album chart. Shortly after the release, the band went on tour in support of the release, out of which the last date was shot to make a very first live DVD released on Oct . 17th entitled "It's Me And Me Against The World". The band also released 2 singles in 2011, “Ie" on July 20th and “spy" on Dec. 14th. On January 16, 2012, [Alexandros] supported the UK rock band KASABIAN for their Japan dates as an opening act, gaining recognition and acceptance from the international music. Soon after, on April 4th the band released their 3rd full length album "Schwarzenegger", which debuted at No.10 on Oricon weekly album chart immediately after release. After another single release of "Kill Me If You Can" from the album in July, the band released a 2DVD entitled "I thought it was only one day" consisting of the liver footage of their Schwarzenegger tour final show on June 30th at Shibuya and a collection of their music videos. Year 2013 was a busy year for the band. They started off by being the supporting act for MUSE on their Japan show on Jan. 11th at the Saitama Super Arena. Soon after, their double A-side single “starrrrrrr / Namida ga Koboresou" was released, containing a natural mineral water GEROLSTEINER tie-in track. Reaching out to wider range of audiences, the single marked No. 11 on the Oricon Weekly Single chart. On May 16th, the band performed on the UK‘s prestigious THE GREAT ESCAPE festival, receiving positive reaction from the UK crowd. Following the festival, the band released brand new studio album “Me No Do Karate." on Jun. 26th which debuted at No.7 on Oricon Daily album chart. The band embarked on an extensive tour “We Don't Learn Anything Tour" visiting all over Japan soon after in support of the new release. This tour gathered 20,000 fans altogether, with ALL dates completely sold out immediately after tickets went on sale! One thing led to another, and the next step-up opportunity was a supporting act for PRIMAL SCREAM on their Japan show on Nov. 5th followed by a double A-Side, double tie-in EP “Run Away / Oblivion" on Dec. 25th. On the video of “Run Away“, the band collaborated with Nike + FuelBand, while the other track "Oblivion" was chosen for the theme song for fall/winter 2013 collection of an apparel brand LITHIUM HOMME. Appearances on music TV programs "Music Station" and "Countdown TV" also helped spread their name and keep the buzz going for 2013 and on to 2014. In Jan. 2014, singer Yoohei participated on a song written for an annual campaign called ACCESS hosted by FM 802. He also went on to hook up with m-flo and collaborated on “m-flo + Yoohei Kawakami / FLY" which was released on Mar. 26th. The band decided to travel across the Pacific and performed at SXSW in Austin, TX on Mar. 12th and 13th. Soon after their return to Japan, they played a SOLD OUT show at prestigious Nippon Budokan gathering 11,000! And on this very day, the band announced their new band name as [Alexandros] (formerly known as [Champagne]). The band hosts a regular program “Welcome! [Alexandros]" on Space Shower TV. Collection of footages from this program was released on DVD titled “SPACE SHOWER TV presents Welcome! [Alexandros]" on Christmas Eve.